Web of Science: Where can I find resources that list all the Norse names for places in Europe and beyond? 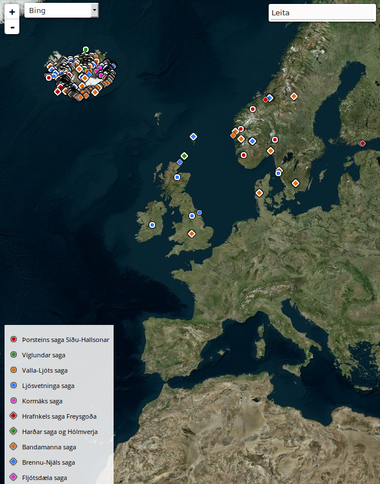 The Icelandic Saga Map is an interactive map of the locations of the Icelandic sagas. The map is fully functional but not yet comphrehensive. By clicking the title of a specific saga, you query the map database about place names related to the saga. You can also query the database of several sagas simultaneously by clicking more than one of the dots placed before the title of each saga. Here is more information about how to use the map. The website also provides references for published literature on place names in the Icelandic Sagas. A map created by selecting ten Icelandic sagas from the Icelandic Saga Map database. I really enjoyed the resources you had on Viking voyages and navigation techniques. I am writing a novel for my own pleasure that takes place in your amazing region around the time of the Viking Age. - Do you have any resources that list all the Norse names for places in Europe and beyond? PS - I feel a certain affinity to Iceland due to my father's side hailing from the Isle of Mann with some Scandinavian Heritage in our blood so again I thank you as a country for preserving so much of that important history. Icelandic Saga Map. (Retrieved 24.11.2015). JGÞ. „Where can I find resources that list all the Norse names for places in Europe and beyond?“. The Icelandic Web of Science 25.11.2015. http://why.is/svar.php?id=71172. (Skoðað 21.4.2019). Where did the Vikings come from and what effects did they have on other countries?